Note: This whiskey was purchased by us for this challenge. At no point were we given a sample or bottle in order to create these reviews (although we wouldn’t have said no). No matter what, our opinions are always our own, honest, and hopefully helpful to you. If you ever get a chance to make it to Nashville, head on over to the Gulch for some great BBQ at Peg Leg Porker. Yes, I know you’re surprised that I’m talking about BBQ on a bourbon blog, but we’re dads, and we veer off sometimes into other things we like. I’m no stranger to some good BBQ either. Now I could go on for a while about how good their food is and how they have been named one of the best BBQ joints in the country by multiple places, but there’s another secret that is kept there that many people in Nashville know. They put out some great bourbon. This is all the work of Carey Bringle, the Pitmaster and the “Peg Leg Porker” himself. After a battle with cancer at 17, Carey lost his leg due to chemotherapy, but his sense of humor and talent for BBQ only strengthened. 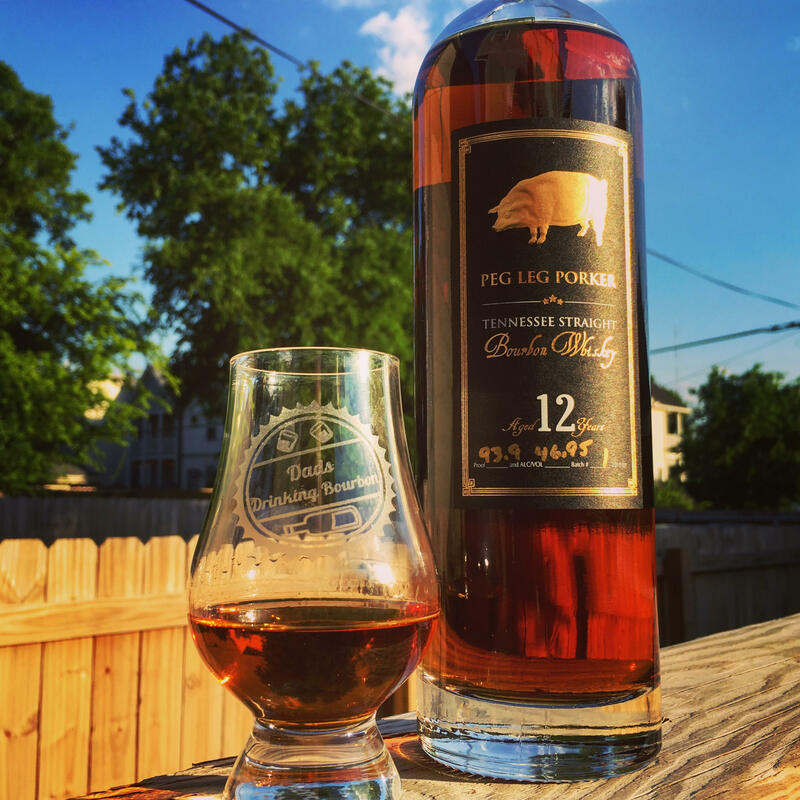 He opened Peg Leg Porker in 2013 and it has had rave reviews ever since. Bringle also uses his talent to source and produce some great bourbon. Although he’s never been a huge fan of the Lincoln County method, made popular in Tennessee. He decided to filter his juice through the same hickory charcoal that he burns in the same smoker he uses for his legendary BBQ (here’s a spoiler: it pays off). Although they have put out NAS and 8 year releases previously, their latest release is a 12 year Tennessee Bourbon that is limited to only 136 cases. That means there are only 816 chances for you to score a bottle. If you want one, you might want to put your computer down and head out to a store. Although Bringle typically likes to release his bourbon at 90 proof, this one comes in a little hotter at 93.9 proof. You would be amazed at how much that 3.9 proof can make a difference. So much of a difference, that this release won Double Gold in the San Francisco World Spirits Competition. So what did I think for myself? Taste: The nose on this one is awfully sweet. It’s like a sweet caramel syrup that’s just waiting to coat your mouth. Taste: Wow… I am still in disbelief. I even had to try this on multiple nights to see if this was really true, but it tastes like I’m drinking BBQ Bourbon. The taste is sweet, syrupy, hickory smoke that literally tastes like it has just come off a rack of ribs. I am so impressed at this one you have no idea. There’s a slight tingle and a faint amount of heat, but you will be more impressed at the BBQ smoke that you may have to taste it again to notice it. Finish: The finish lingers, and you’ll want it to. It makes you feel full, like you just had a taste of a great meal. Overall Verdict: I know the $80 price tag will turn some people off, but I am always a sucker for people that are doing innovative things with Bourbon and doing them well. The fact that Bringle finds ways to combine his love for BBQ with his love for bourbon really went above and beyond for me. His love for the product and his desire to put out something good definitely is evident in the taste of this one. I’m on the Buy It train.